David Mulroney is a Distinguished Fellow at the University of Toronto’s Munk School of Global Affairs and Public Policy. 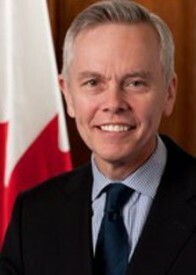 He served as Ambassador of Canada to the People’s Republic of China from 2009 to 2012. Prior to his appointment to Beijing, Mr. Mulroney was assigned to the Privy Council Office in Ottawa as the Deputy Minister responsible for the Afghanistan Task Force, overseeing inter-departmental coordination of all aspects of Canada’s engagement in Afghanistan. He also served as Secretary to the Independent Panel on Canada’s Future Role in Afghanistan (“the Manley Panel”). Mr. Mulroney’s other assignments included serving as Associate Deputy Minister of Foreign Affairs and, concurrently, as the Prime Minister’s Personal Representative to the G8 Summit. Immediately prior to that, he served as Foreign and Defence Policy Advisor to the Prime Minister of Canada. A career Foreign Service officer, Mr. Mulroney had a series of senior appointments in the Foreign Affairs Department in Ottawa, including 4 years as Canada’s Senior Official for Asia Pacific Cooperation (APEC). He served on overseas assignments in Taipei, Kuala Lumpur, Shanghai and Seoul. From 1995 to 1998 he was Executive Director of the Canada-China Business Council. Mr. Mulroney graduated from Saint Michael’s College in the University of Toronto. He joined the Foreign Service in 1981 and participated in full time Mandarin training at the Canadian Forces Language School in Ottawa. Mr. Mulroney, who was born in Halifax, Nova Scotia, is married and has three children.